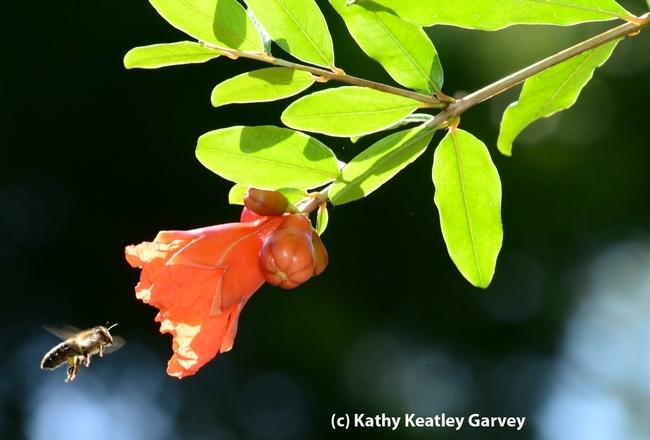 Count Your Blessings--and Thank the Bees! It's Thanksgiving. Count your blessings--and thank the bees. If your table includes pumpkin, cranberries, carrots, cucumbers, onions, apples, oranges, cherries, blueberries, grapefruit, persimmons, pomegranates, pears, sunflower seeds, and almonds, thank the bees for their pollination services. Ice cream for dessert? Thank the bees for that, too. Cows feed on alfalfa, which is pollinated by bees, and cows provide milk, a key ingredient for ice cream. Honey bees provide us with honey, often described as "the soul of a field of flowers." But more than that, they pollinate some 100 crops, from almonds to watermelon. So, besides saying "Happy Turkey Day," we ought to include "Happy Bee Day!"